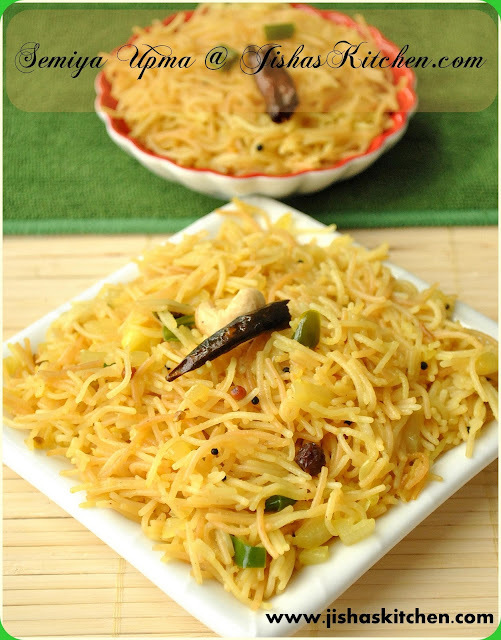 Today I am sharing the recipe of Semiya Upma or Vermicelli Upma which is an easy to prepare breakfast item and is very delicious too. Indian vermicelli is made of semolina. Even vermicelli can be used for making payasam or Kheer. Then cook semiya by adding enough water along with enough salt in a medium flame for about 8 minutes or till the vermicelli becomes soft. Then drain it in a colander. Then finally add cooked vermicelli and mix it nicely.Remove from the flame after 2 minutes. You can have it with some tomato sauce or with just sugar which is also very tasty. 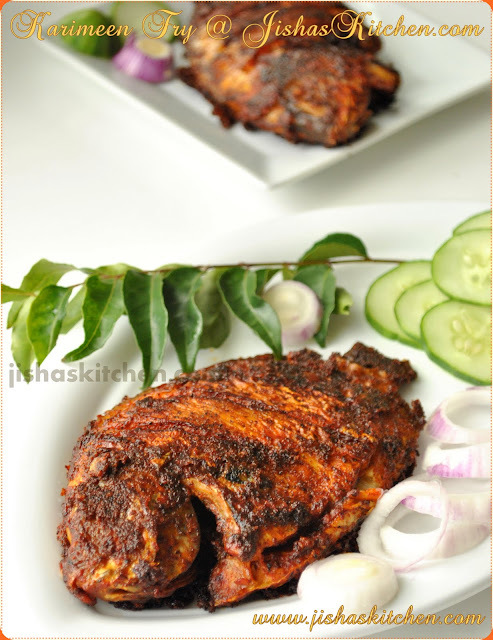 Jisha- I love this n your platter looks very tempting!! i always enjoy making this...looks yum! 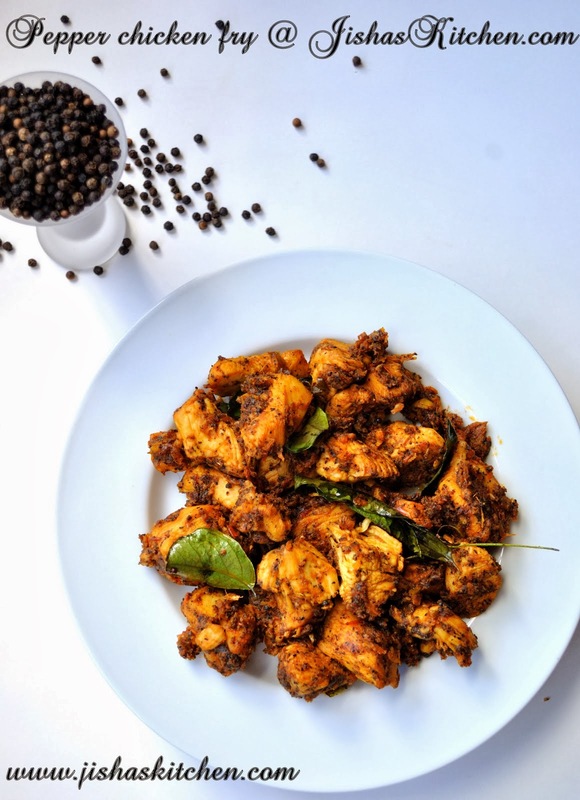 My favourite upma, looks inviting..
nice clicks..looks so yummy jisha!! Semiya upma looks delicious and tempting one. Everytime I make this.. it becomes like a semiya paste! Will try your way now.. looks soooo good. Not a great fan of upma..this looks awesome..very inviting! Such a tempting click and looks delicious! First time here.. your kitchen is just amazing Jisha.. I m following you now.. Upma is my fav. I can have it anytime..
love semiya upma. Looks perfectly done. I am first time to ur blog...ur blog looks so wonderful !!!! prefect semiya upma and excellent presentation. The gorgeous looking upma I have ever seen before,perfect! 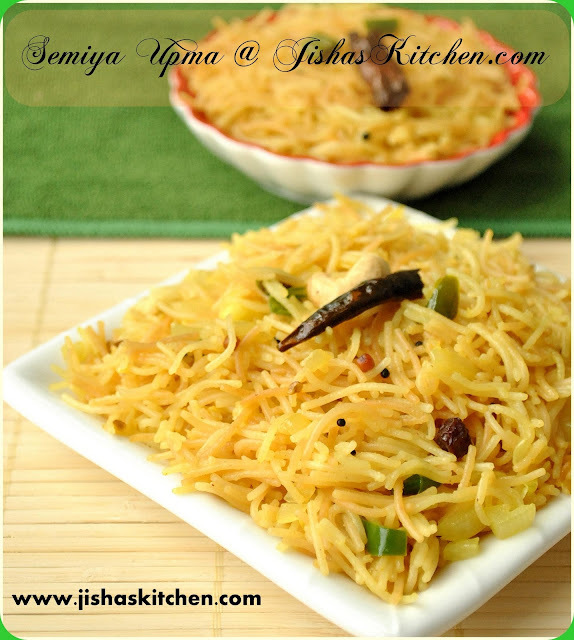 semiya upma, a healthy and nutritious Indian Snacks. looks yum.